World 5-1 is the first level of World 5 in New Super Mario Bros. It is the first and only level to include Snow Spikes. Platform Blocks are also common in this level. 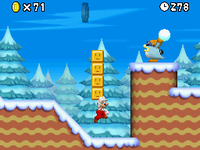 The level begins with a Snow Spike on a platform directly above Mario's head and four Goombas in front of him. Then, after Mario jumps over the pit beyond the Goombas, there are some trees that have snow on them. The second tree drops the snow, which traps Mario underneath it for a moment if he is hit by it and makes him vulnerable to enemies. Following the trees are a few ? Blocks and an indentation containing deep snow. 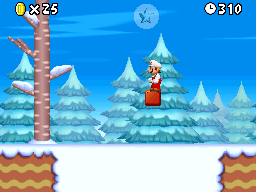 The snow causes Mario to sink in a little and reduces his jump height. Soon after that are a few more trees, Goombas, and another Snow Spike. After defeating or passing the Snow Spike, Mario can get the first Star Coin. Then there is a pit of deep snow with two ? Blocks above it, a slope, and another Snow Spike. A short distance after the Snow Spike, there is another ? Block and a pit; the Checkpoint Flag will appear around this point, and leaping over the pit brings Mario to the second Star Coin. Soon after passing the second Star Coin is the third, protected by a Snow Spike. After avoiding the rest of the Snow Spikes, Goombas, and harmful snow, Mario reaches the Goal Pole. Star Coin 1 - Before the checkpoint, the Star Coin is above a bit of falling snow. Mario should use the nearby ? Block to ascend to the Star Coin. Star Coin 2 - The second Star Coin is above a Koopa Paratroopa after the checkpoint. Mario should either jump on the Koopa Paratroopa or the Flying ? Block to collect it. Star Coin 3 - The final Star Coin is near a Platform Block. Mario should hit the Platform Block three times to be able to collect the Star Coin. This page was last edited on April 6, 2019, at 01:39.